"If you need assistance with the repairs PM me drop me a text/WhatsApp at 91246065"
I'm here to share my observations about kdk fans in Singapore. I recently took on a hobby of helping people repair kdk fans and have repaired about 200 sets to date so i will share some of my observations. I know kdk is the brand that many people trust when it comes to fans and the brand of choice for many homeowners, but before you spend your hard money you might want to read on. The biggest and most common problem with kdk fans i notice is failure of the PCB board. This happens on the electronic living, wall and ceiling fans. What often happens is that when you press the button to turn on the fan, the fan automatically switches off. Or when you press the oscillation, timer or 1/f yuragi button the fan will switch off. This problem is observed on kdk and Panasonic living,wall fans manufactured after about 2005. 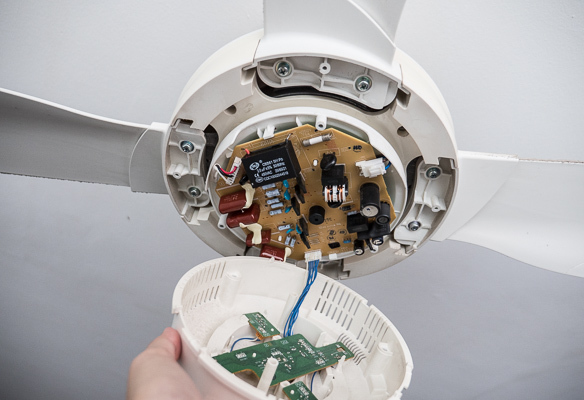 On ceiling fans particularly A11YS, M11SU and R48SP, the fan may become stuck in one speed and will no longer respond to the remote. All this is caused simply by one small capacitor in the PCB board of the fan. I've had numerous customers who have thrown away their cosmetically perfect fans because of this problem when it could have been easily repaired. Secondly is the dip in quality of their fans. As I've seen fans from various generations of each model, i can see a consistent downward drop when going from one generation to the next. The main thing is the PCB board, my old kdk fan of 20 years has its PCB still perfectly working whereas my recently bought fan of the same type ,PCB failed within 2 years. I notice that PCB failure is most prevalent in M40KS, N40HS , PL30H and M40MS. So, if your fan ever fails,in terms of the faulty PCB or the fan suddenly stop running. Please dont throw them away, although kdk might fail, it is also one of the easiest fans to repair. If the PCB, simply get the capacitor changed and your good to go. If the motor suddenly stop spinning , the thermal fuse is blown and can be changed, If spinning slowly is because the motor capacitor is faulty. Bottom line, even if these fans fail, they mostly can be repaired. So do a favor to the environment and your wallet and try repairing before throwing away. Also do consider carefully before buying kdk fans. If attempting any diy repair shared here, pls proceed with the necessary caution at your own risk. If you need assistance with the repairs drop me a text/WhatsApp at 91246065. Nick, dereth, Sniper Wolf and 27 others like this. Last edited by Jmathew1108; 14-03-2019 at 01:01 PM.. I did have 1 fan M40MS PCB Board faulty. Did u do repair on this ? If yes how much do let me know. I might as well give u some business on this. How about the newer DC fan with led like U60FW? Suggest you don't buy. If you need light go for fanco or crestar. If the PCB fails the you'll lose all control of the fan. If other brand remote spoil just change the receiver and good to go. Kdk need to dismantle from ceiling and pull out PCB board and replace. Somemore only 1 year warranty even at $800. Kudos to u. Thks for saving our fans. Kdk need to dismantle from ceiling and pull out PCB board and replace. Somemore only 1 year warranty even at $800. Just to share, for KDK v56VK, doesn't require dismantling from ceiling. The PCB can be accessed by removing the cover, then just unplug and replace. I had KDK replace it before. I called them about a rattling/buzzing noise, they came and replaced it without doing any diagnostics. Wasn't happy about that. What if the rattling was something mechanical, or maybe even just the cover of the fan that was loose...etc. At this point it was about 4 years old. The funny thing is, just a few months ago, I ran into the problem where the top speed was more like medium speed. Luckily I asked to keep the old PCB. I replaced the 1 yr old PCB with the 4 yr old PCB and it's back to how it was. My next ceiling fan will not be a kdk. Last edited by kandinsky; 20-03-2016 at 11:41 PM..
[QUOTE=kandinsky;100365388]Just to share, for KDK v56VK, doesn't require dismantling from ceiling. The PCB can be accessed by removing the cover, then just unplug and replace. I had KDK replace it before. I called them about a rattling/buzzing noise, they came and replaced it without doing any diagnostics. Wasn't happy about that. What if the rattling was something mechanical, or maybe even just the cover of the fan that was loose...etc. At this point it was about 4 years old. I don't own ceiling fans so i can't give definite comment but based on online reviews and experience of people i know both brands are very good especially at their respective price points. You can get fanco FFM 3000 with LED light, remote and installation at about $265 on carousell through some sellers. This one comparable to the latest kdk U48FP with LED light which costs $550 without installation. Somemore Fanco lifetime warranty on motor. Crestar can cost as much as kdk depending on model but alot more stylish and 10 year warranty on motor. Personally i feel these 2 brands more bang for my buck. any idea among the more budget brands ( such as mistral, sona, morries, toyomi, europace, etc ), which brand is better? How about Elmark? I know there is a place in JB which can purchase Elmark Fan with Light and they can deliver to Singapore with some charges but I still prefer DC motor though. Megadark and kandinsky like this. Their after sales support in Singapore is very poor. But since you buying from Malaysia that shouldn't be a concern. It should be ok as long as properly installed. Yes, I agree that KDK and ME produces quality fans(thus the price). I myself have both brands at home and they work well, only thing is the ME Living Fan that I owned the speed 1 button is sort of faulty, as it wouldn't respond to presses at times, but otherwise I would say ME fans are really good, performance on par with KDK. The only downside for ME fans is as what you mentioned, the availability of it.